It’s all too easy for couples to fall into the same old, take-out routine. When “Honey, do you want pizza for dinner?” and “Hey, how about Chinese tonight?” become your daily dinner-talk, it’s time to change a few things. Not only does cooking healthy food at home help your body and your health, it’s also a great way for couples to spend time together. That may be true, but being busy is no excuse to neglect your significant other, and it certainly isn’t an excuse to eat take-out 5 nights a week. When you and your spouse cook together, you naturally decide who does what tasks, you maneuver around one another, and there’s usually a fair amount of passing salt shakers and spices back and forth. When you act as a team, you not only get your meal prepared faster, but you’re also more satisfied with your dinner, and you get to interact with one another throughout the entire process. Unlike my grandparents’ version of cooking dinner, which involves my grandfather watching TV while my grandmother cooks in the kitchen, cooking dinner with your spouse lets you catch up on the day, laugh together, and spend what precious little non-working time you have in each other’s presence. What happens when you order takeout? You sit on the couch and shovel pizza into your face, right? (I do.) Doing something active and engaging with your spouse to get dinner ready is a much more proactive way to eat together. Not only will you have a healthier relationship, but you’ll find yourself eating healthier foods as well. When you and your spouse are the ones assembling your meal, you’re much more likely to go easy on the butter, choose to bake instead of fry, and put together a well-rounded entrée. If you’re ordering takeout or going out to eat, you don’t know how your food was prepared, how much grease is actually in it, or even if clean water was used to prepare it (though this is often more of a concern to us city-folks). By cooking at home you can choose all of your own ingredients, cut out unhealthy fats and feel good knowing that everything you’re eating is safe and healthy to consume. Trying new things with your significant other is a great way to breathe some life into what may have become a boring relationship, and cooking together is a fun and easy way to do just that. Are you a noodles-n-veggies kind of couple? Try your hand at making sushi rolls together. 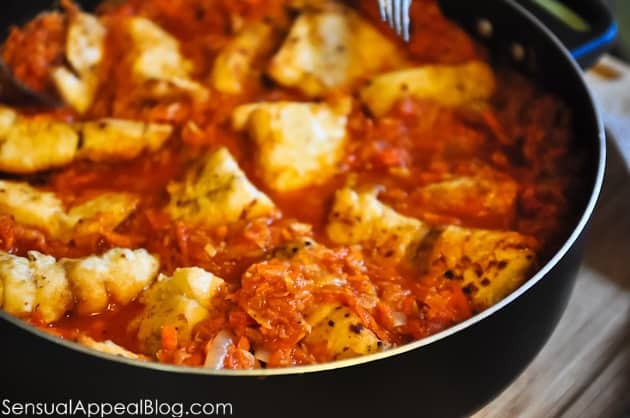 Chances are you’ll mess up the end result terribly, but it’ll still taste good and you’ll have a great time together fumbling through the preparation process. If your guy is a steak and potatoes kind of man, encourage him to help you make some homemade black bean burgers. You’d be surprised how much these healthy sandwich patties taste like a burger. If you need some extra encouragement to get your spouse to eat a non-meat burger, add some chipotle seasoning or chili powder and onions to give it a little extra umph. Lastly, one big difference I’ve noticed since my husband and I have started cooking together is that we’ve started doing a lot of other healthy things together too. We go on long walks together, we go hiking together, we now both exercise regularly, and I’ve even started challenging him to Ping-Pong matches (a good workout, but something I’ll never win at). When you start making one healthy improvement in your life, and your spouse is doing the same thing, it gives you another reason to bond and makes you want to be healthy and happy together. Studies show that when people are healthier, they are also happier; and if you and your significant other are happy and healthy together, chances are your relationship is going to be a happy one too. This is a post by regular Sensual Appeal contributor, Kayla Matthews, a Green movement enthusiast and productivity blogger at Productivity Theory. Follow her on Google+ and Twitter. 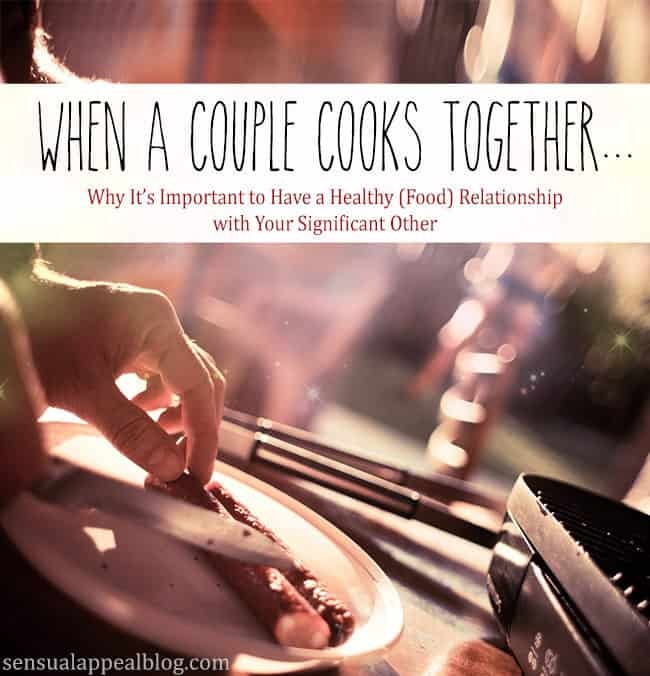 Do you and your significant other cook together? What is your favorite dinner to prepare with your partner? you know, we never ever ever ever do it. Great post!! We’ll do little things together and it’s always fun to have company in the kitchen! Hi Lora! I’m so glad you enjoyed my post! Doing little things together is a great way to get more quality time as a couple out of each day. Thanks for sharing your comment! Mmm Asian dishes are the best! And I totally agree – it’s always so much more fun when you do it with someone you love. It’s funny- one of my “requirements” (pretty much my only) for a husband was that he wasn’t picky. My husband and I love trying new food together and cooking. We usually pick a theme or try something difficult. It’s a fun date night in! I love cooking with my guy and I have to admit he is much better at it than I ever will be, but having this time together is priceless! Thank you for the great idea :-). I will try this out with my man. Great idea, I’m totally sending this to my husband to read. A great way to strengthen our relationship and get hubby involved in our food. This is great! 🙂 Have fun! Heck yeah! Love this idea! My hubby and I have been trying to implement this for a while but haven’t truly taken the time to do it, so I’m glad to read an encouraging reminder 🙂 Your photography is very beautiful too. As someone who worked in the restaurant biz almost a decade, I freak my (non-cooking) husband out. I’m trying to learn ways to encourage him to cook, and to cook with me, and I love any inspiration I can get. Love this post! Thanks for sharing your comment with us and I’m so glad you enjoyed my post! Haha, hey you never know – maybe he’s got a secret talent for baking! You should see how it turns out 😉 I think that’s great, I want to learn how to make Indian food – so so good! Thank you for the love, Abinaya! Hope to see you back here soon!